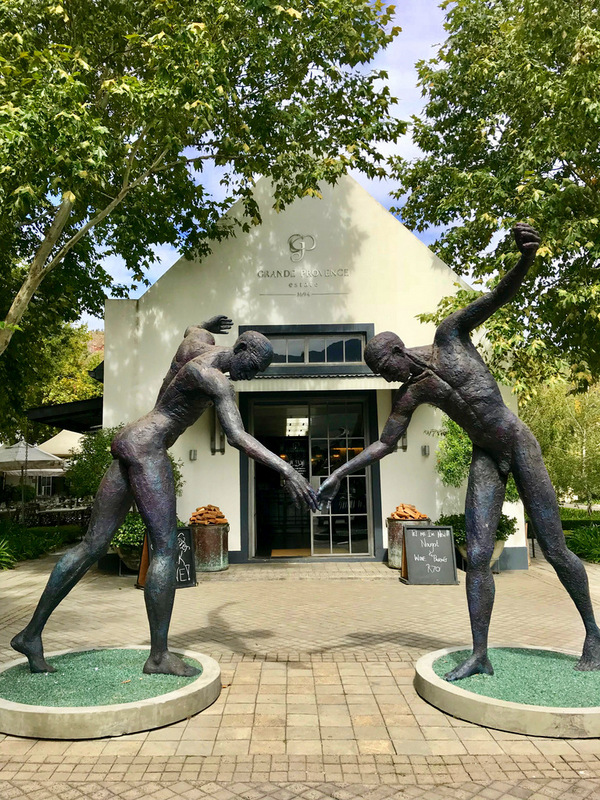 This is part 3 of my “Franschhoek Exploring” series. 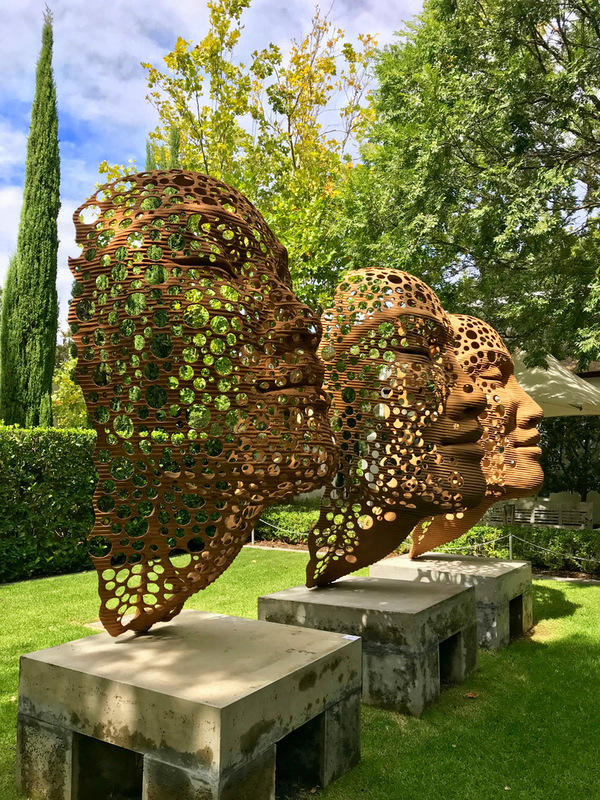 If you missed part 1 (Marigold Restaurant) & 2 (Franschhoek Village Market) – you can check it out over here and here. 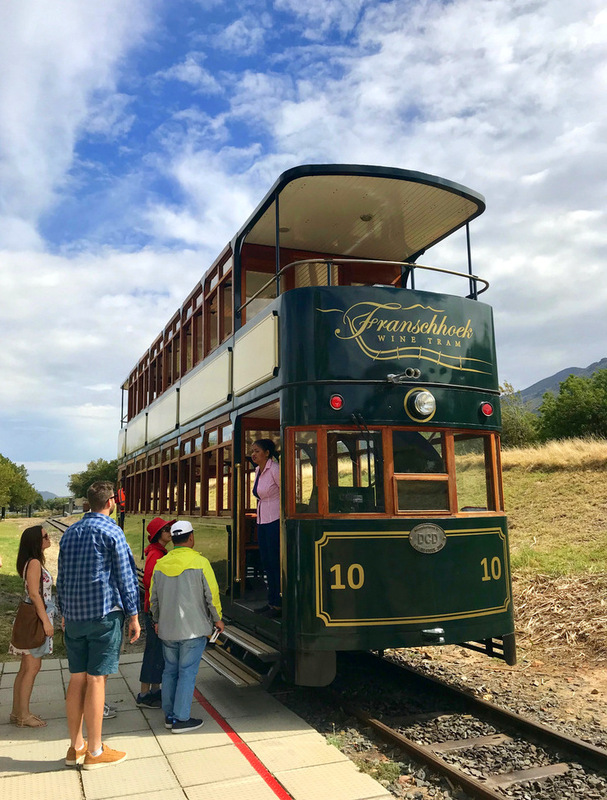 So this wasn’t the first time that I had done the Franschhoek Wine Tram, I actually wrote about it back in 2016 and the post ended up being a big hit. (You can check out my original post over here) I enjoyed that experience so much I just knew I needed to grab the opportunity to do it again, this time just opting to try a different line. 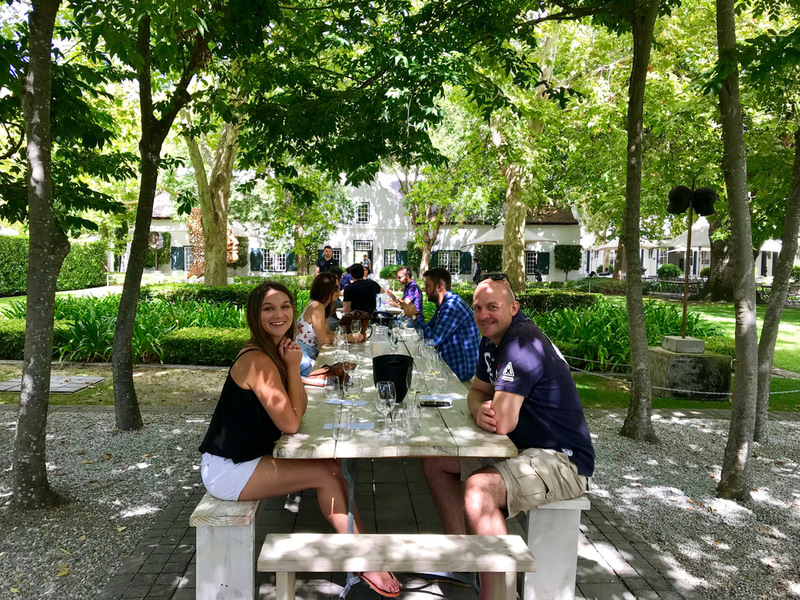 I also figured for those who may have missed my previous post, I would do a little refresher post, because to me this really is the top thing to do when visiting Franschhoek. The Wine Tram is a hop-on hop-off experience. Depending on how early you head out (and how much energy you have), you can visit up to 6 farms. All lines close at 6pm, so you’ll need to make sure you catch the last ride back into town before then. They have 6 different lines which pass different wine farms. The first time I did the wine tram we did the Green line and this time round we opted to try the Yellow line. You can get more information about the different lines over here. 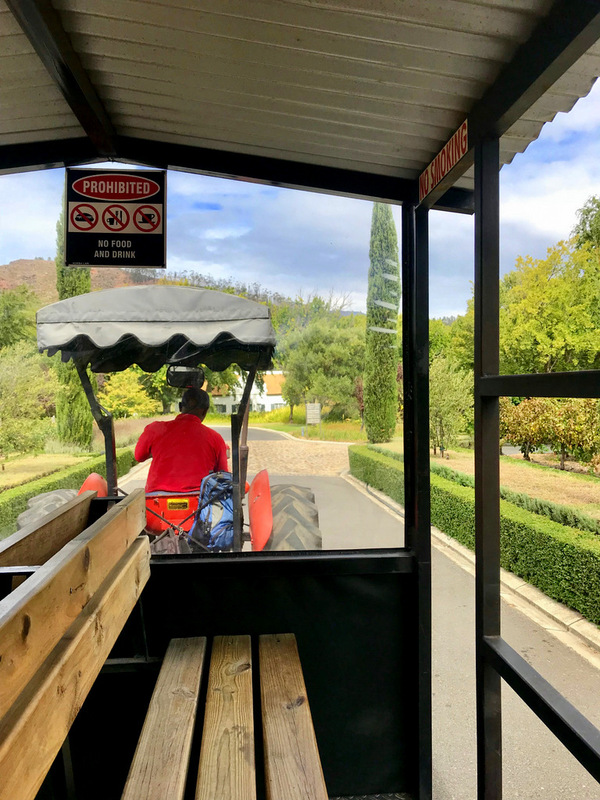 Not all the farms are actually connected by the tram line, so at a certain point you’ll get onto the tram bus. But don’t let that be a worry because the tram bus is equally cute. The tram (and tram bus) pass each stop once an hour. This means the minimum duration at each stop is 60 min. All the lines depart from & end at their ticket office in the center of the Franschhoek Village. You can buy tickets on the day or online. During winter (from 15 May to 14 Sep) they only operate certain lines on certain days. Be sure to check their website for these details. Food or open alcoholic beverages are not allowed on the tour. So unfortunately you can’t pack your own picnic basket. But trust me, will all the great restaurants to choose from, you’re not going to want to anyway. Take a warm jacket with you as it gets quite chilly on the tram (and bus). Take water along – you’re going to need to hydrate in between wine stops. Don’t try to squeeze in too many stops. Rather plan in time to relax and enjoy your surroundings. Pace yourself. 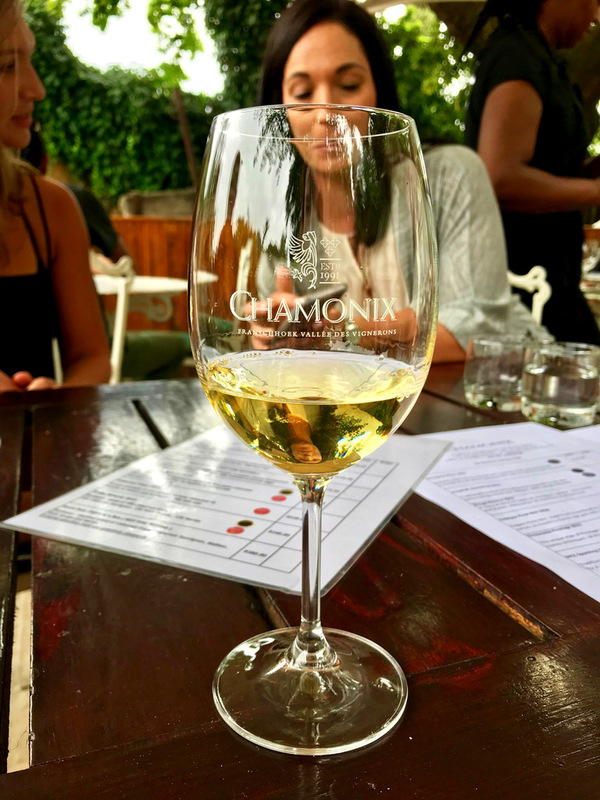 You definitely don’t want to peak at the first wine farm and then be completely boozed for the rest of the day. Also, if you’re heavily intoxicated, they can also ask you to leave the tour. Plan ahead by making a restaurant reservation for lunch a couple of days in advance, particularly if the one you have your eye on is known as a super popular dining spot. I would say it’s definitely a better idea to book your tickets online to avoid any disappointment. They only hold a limited number of tickets for sale on the day. If you buy wine along the way, ask the conductor to keep it for you and then you can just collect it at the end of the line. As happy as a clam! Absolutely love all the art! 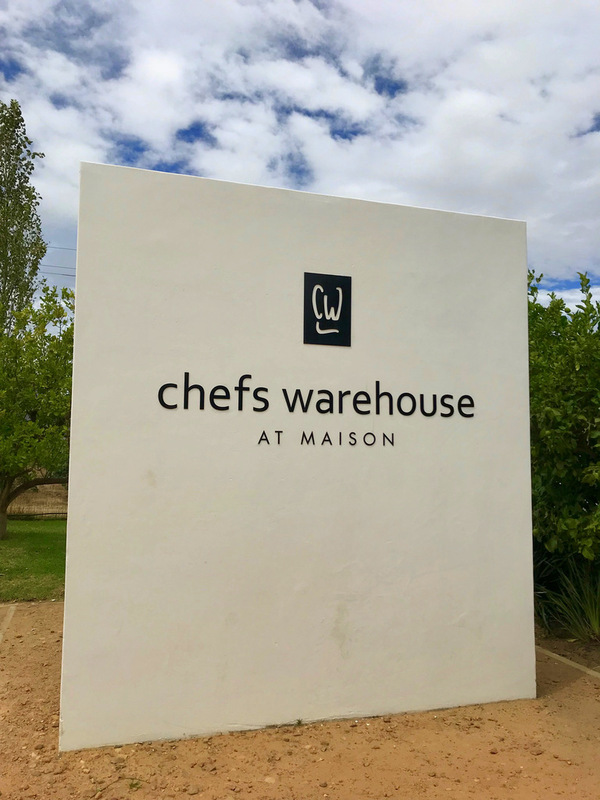 We had lunch at Chefs Warehouse at Maison – but more about that in my next post! Although we only managed 3 stops this time round (compared to the impressive 5 stops the previous time I did the wine tram), we had an equally fantastic day. So that’s why I feel you shouldn’t feel too pressured to see as many wine farms as you can. Pick the ones you’d most like to see, but then also be willing to drop one or two if you feel like lingering a bit longer at some of the stops. Whatever you miss can simply be done on another day! (any excuse to do the wine tram over-and-over again really). So yeah, been looking for a fun outing not too far outside of Cape Town? Look no further. 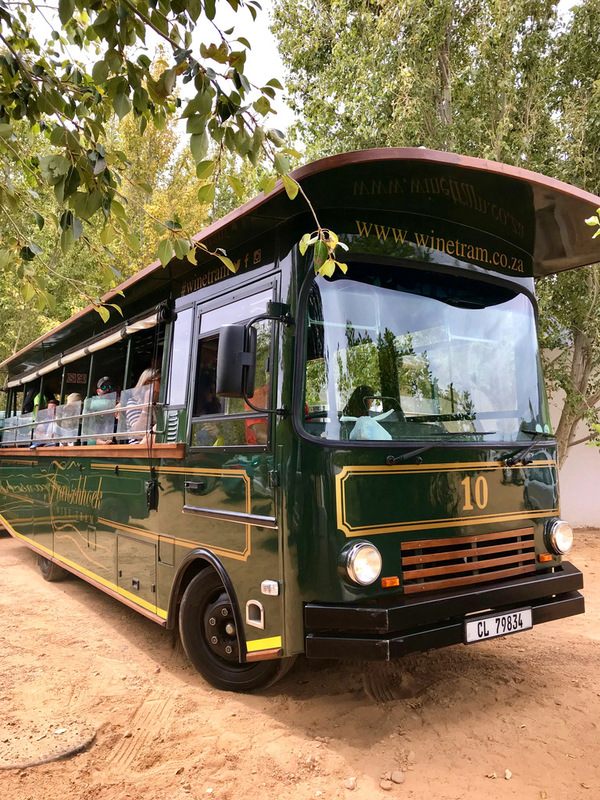 Hop on over to winetram.co.za and book your tickets now.